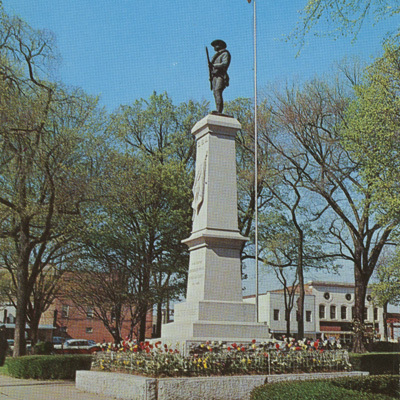 Description: Standing over twenty feet tall, the monument consists of a bronze statue of the Confederate Private Soldier as he faces north, alert and ready with his rifle in his hands. A draped Confederate flag is shown in bas-relief on the tall, taperd column, with the initials of the Confederate States of America -- "C.S.A." -- in raised lettering above the flag. The column is a massive piece of granite, with individual sections weighing reportedly eight to twelve thousand pounds. The column rests atop a large piece of granite, reportedly weighing itself upwards of eighteen thousand pounds, with the entire structure resting on a base of crushed rock and cement. Unveiling & Dedication: The monument was erected on the site in front of the Cleveland County Courthouse in November 1906. The dedication took place with exercises on May 10, 1907. Subject notes: Despite the general reluctance of the citizens of North Carolina to endorse secession and the Confederacy, Cleveland County residents strongly supported the Confederate war effort and sent many men to the war along with neighboring Gaston County. Following the war, there was strong support for the memory of the Confederacy and its meaning for the South, and Cleveland County became the home of an active chapter of the Ku Klux Klan between 1868 and 1872. After Lee's surrender at Appomattox, Federal troops occupied the Courthouse Square in Shelby, staying until 1872 in an attempt to suppress the Klan. In 1906, the erection of the monument in front of the courthouse became an official memorialization of the Confederacy and an official reclamation of territory in its name. According to a newspaper account of the monument's construction, the base of the monument was so massive that ten mules were needed to pull it on a wagon from the Southern Rail station to the Courthouse. In 1991 the United Daughters of the Confederacy sponsored the restoration of the sculpture by Karkadoulias Bronze Art of Cincinnati, OH. Location: The monument sits in front of the Old Cleveland County Courthouse in Shelby, at the intersection of South Lafayette and West Dale Streets. The Old Courthouse is now home to the Cleveland County Historical Museum. Landscape: The monument sits in the middle of the sidewalk directly in front of the entrance to the Courthouse. The area is surrounded by a lawn, mature shade trees, flowering shrubs, and seasonal plantings. Horrifying. A statue commemorating terrorism and slavery?!? Is there a statue of Osama bin Ladin or Hitler next to it? And a benign mention of the Klan as well. Disgusting. This statue needs to be removed.